The shipowner and politician William Schaw Lindsay (1816-77) combined a wealth of personal experience with a meticulous approach to research. 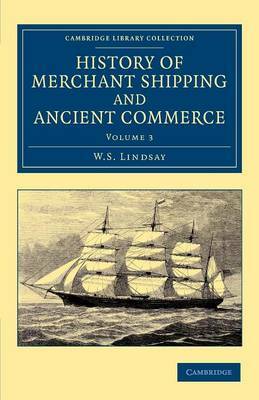 Originally published in 1874-6, this is his authoritative four-volume history of the world of ships and maritime trade. Its coverage ranges from the legend of Noah's Ark, through ancient commerce and the colonising expeditions of the middle ages, to the progress brought about by the introduction of steam to the shipping of Lindsay's own day. Details on construction and performance sit alongside explanations of the customs and superstitions of seamen, complemented by full accounts of many important nautical events. Volume 3 describes the extraordinary progress made by the United States of America in the first half of the nineteenth century, discusses Cromwell's Navigation Acts and the causes and effects of their abolition, and concludes with a warning against excessive legislation. Lindsay's practical knowledge and enthusiasm for his subject are evident throughout the work.